The Littleborough & Shaw Magazines fits nicely into the gap between expensive Directories, the local newspaper, and complicated ‘pay per click’ Advertising, providing great value, reliable, straight forward local advertising. 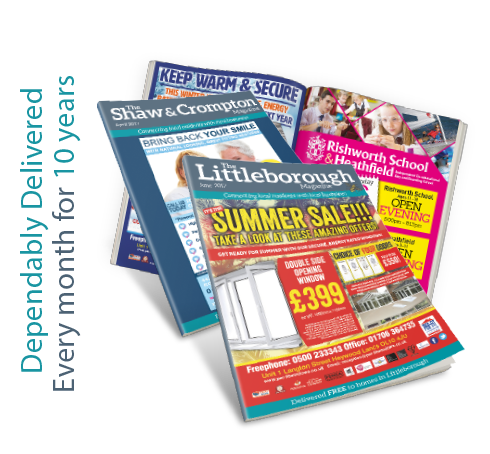 The Littleborough & Shaw Magazines are glossy high quality monthly magazines, dependably delivered by our own team directly into 10,000 homes in the local community every month for over 10 years and not just left to be picked up. The Magazines are so well received that we regularly get fantastic compliments from residents. Local resident say they feel ‘safer’ using local tradesman and services. Local residents tell us that they keep their copy in the same place and simply change it for the next one when it lands on the mat. The most inexpensive advertising we’ve ever done with huge return!! Very pleased! We love this little magazine!! This magazine is by far the most effective advertising I have ever experienced in the 6 years I have advertised my business. Consistency proved customer retention and new customers pays off! I encourage any business to sign up with The Littleborough and Shaw Magazines. They are the best! They are so easy to work with from concept to publishing. The ads always look great and get results. This form of advertising has helped me build my business. It has given me a wide range of customers and I am glad I started it. The most inexpensive advertising we've ever done with huge return!! Very pleased! We love this little magazine!! Best results for our spending out there! Great customer response. The Littleborough Magazine is hand delivered into 5,000 homes across: Starring Way, Birch Hill, Stubley Hall, Wardle Village, Smithybridge and up around Hollingworth Lake. WHAT SIZE WILL YOUR AD BE? Remember regular advertising is crucial. Readers need to see your advert a minimum of 3 times before they may respond. Better one area three times, than both areas just once. DESIGN WHAT WILL YOUR AD LOOK LIKE? 8 words or less if possible. Over 90% of our advertisers either remain with us or return to us, and many of them tell us that The Littleborough & Shaw Magazines provides them with more business than any other form of advertising. Why not try us for yourself! Using The Littleborough and Shaw Magazine, costs a lot LESS than you think!